Helping Smokers Quit: A Role for Smokeless Tobacco? This report examines the "low-dose hypothesis" the idea that in some instances, low doses of a substance may have adverse effects that do not occur at higher doses. This is a popular narrative created by environmentalists to promote the belief that though normal doses or a chemical have no effect, while high doses that can't occur normally are bad, low doses can be an "endocrine disruptor". Since the 1990s Pete Myers and others who leverage anti-science beliefs for financial gain have been marketing low-dose effects, but are they real? Their claims are not supported by the available data, in our report. "The studies that have been alleged to support the low-dose hypothesis cannot be validly extrapolated to the human situation; the effects observed in these studies are inconsistent and not necessarily harmful; and the doses at which the studies have been performed are higher than the doses to which people are customarily exposed. There is no compelling evidence that people are being put at risk by current levels of exposure to bisphenol A or other substances alleged to be endocrine disruptors. 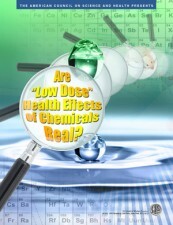 Download Are 'Low Dose' Health Effects of Chemicals Real? or read it in the window below.